What happens when the most valuable part of a company is its image? Of course this sounds like a question a marketing manager would pose as a way to sell his or her services, but honestly there have been times in history where what a company produces is nowhere near as valuable as its brand recognition. Take Red Bull, the energy drink manufacturer turned de-facto sponsor of nearly every sporting event known to man: it has been described as a marketing company that also happens to sell energy drinks. And that’s not far off. The company has technically been selling energy drinks since the late 1980s, but it wasn’t until 1997 when it showed up in the U.S. that its popularity started to increase rapidly. But the marketing and media creation behind the company have helped cement an arguably terrible-tasting caffeine bomb as the leader in energy drinks. Many people – especially young people – now recognize Red Bull as a promotions and media company due to its broad sponsorship of events around the world. While it does create $7 billion in revenue from selling its drinks, and only a fraction of that from subsidiary Red Bull Media House GmbH, the efforts by Red Bull Media House are, at this point, possibly the largest reason Red Bull is holding on to its leading position in the industry; it is just so dang visible. If Red Bull stopped its sponsorships and media efforts and simply advertised its energy drink via commercials, billboards, and the odd promotion, it’s likely it would slowly fade into history as we focus on the next new thing. Red Bull’s business model relies heavily on having a brand image that jumps out when you think of anything sports related, which is a huge portion of modern entertainment. Other companies have tried this tactic to varying degrees of success. One that was sort of forced into it was Gulf Oil, the once-behemoth of oil production that, through economic depression, getting acquired, and a shift in the oil production economies, became a name that has more history and less substance than you might think. Gulf was a popular racing sponsor and a well-known brand for service stations around the U.S. throughout the middle part of the last century. Following its acquisition by Standard Oil and the new amalgamation that was rebranded as Chevron, the Gulf Oil brand slowly shifted into a “new economy” business that mostly focuses on intellectual property like its associated brands, product specifications, and scientific expertise. That is why, thanks to weird business dealings, we can still have Gulf livery on racecars and co-branded watches like the newest iterations of the Monaco from TAG Heuer. Even though Gulf Oil doesn’t exist as it did in the days of Steve McQueen and the iconic Ford GT40s and Porsche 917s, the branding and image are still around, and those are much more valuable than any physical product. Gulf Oil and TAG Heuer (well, when it was still just Heuer) began their relationship as sponsors of automotive racing including Formula 1 and Le Mans. Both companies sponsored the John Wyer Automotive team, which saw the creation of the now-iconic Gulf livery and the connection between the two brands. Both companies sponsored other teams, including McLaren at different times, but the Gulf Oil livery on the Wyer Ford GT40s and Porsche 917s inspired the next half-century of auto racing and became synonymous with motorsport at its finest. And Heuer was part and parcel of the look. The unbeatable combination of powder blue and bright orange stands out as one of the most well-known racing liveries in history, alongside other greats such as Martini Racing, Marlboro, Castrol, and a more modern icon: Red Bull (how about that?). The Gulf livery somehow even stands out to people who might not even be familiar with racing, probably due to its pop-culture ties thanks only in part to Steve McQueen and the film Le Mans. The livery has found its way onto nearly every type of object a racecar nerd might want, seeping into the public consciousness. For that reason, powder blue and bright orange has become a color scheme as valuable as any product Gulf Oil might want to produce. And TAG Heuer understands the value of an established image. The Heuer of the John Wyer Automotive era was eventually acquired through a default takeover in 1982 thanks to a bad series of events including China closing its borders to imports and Heuer being stuck with recently purchased components and nowhere to sell them. The company was finally bought by TAG (Techniques d’Avant-Garde) in 1985, kickstarting its modern era without Jack Heuer. Jump forward to 1998, shortly before TAG Heuer was purchased by LVMH, and the Monaco made famous by Steve McQueen in Le Mans is reissued to cash in on brand heritage after the successful re-launch of the Carrera (thanks to a little help from Jack Heuer). This attention to image and heritage may have helped convince LVMH to acquire the brand since almost immediately following the acquisition Jack Heuer was named honorary chairman, becoming somewhat of a driving force within the brand again. Only five years later, the first modern Gulf-inspired Monaco made its debut, taking cues from the Gulf racing suit McQueen wore in Le Mans, which was actually Jo Siffert’s personal racing suit. Then, two years later in 2007, the first truly Gulf-branded Monaco was released, recapturing the historic connection between the two brands that had been forged four decades prior. Now, after three iterations and eight years of waiting, the latest TAG Heuer Monaco with Gulf livery has been released, soon followed by a second limited edition, all following the announcement of a new global partnership between Gulf Oil International and TAG Heuer at the 2018 Geneva Motor Show. The announcement preceded Baselworld 2018, where TAG Heuer released the Monaco Gulf 2018 Special Edition powered by Caliber 11, giving it the historical left-handed crown layout. The non-limited edition features a dark blue dial with light blue and orange stripes along the right side and the Gulf logo at 6 o’clock. The strap is blue leather with orange stitching, adding a bit of Gulf around the wrist too. The rest of the dial feels very loyal to the original, if not in every detail then the overall look. The Heuer logo is lacking the TAG header like other vintage-inspired pieces recently, which makes many fans quite happy. Since I wasn’t alive before it was called TAG Heuer, I don’t have a particular disdain for the TAG Heuer logo, but I do feel that simplicity in logo design is always better. The Gulf 2018 Special Edition gives me cause for pause, however, when one looks to the limited edition released a few months later. In June, TAG Heuer released the Monaco Gulf 50th Anniversary limited edition that was largely the same watch, but seen side by side the colors were quite different. The non-limited special edition had muted, almost aged colors that felt like they had darkened over time on an old photograph, whereas the 50th Anniversary Limited Edition featured a vibrant dark blue dial with truly powder blue and light orange stripes, which feel more loyal to the colors you see on the actual cars. So while the first special edition is more nostalgic, the anniversary edition feels much more visceral. The strap is even black leather on the anniversary piece, making it also feel like it hasn’t faded with age. Viewed separately, they both look amazing. But when compared side by side, you quickly pick which one feels right to you. And wouldn’t it be my luck that I prefer the dark blue dial and strap of the Monaco Gulf 2018 Special Edition over the orange and powder blue of the Monaco Gulf 50th Anniversary Limited Edition? Yet I also prefer the more faded orange stitching on the blue strap than the bright stitching on the black strap, so it seems I am out of luck. Well, no matter, because the Monaco Gulf 50th Anniversary Limited Edition was limited to 50 pieces, which sold out in no time. The Monaco Gulf 2018 Special Edition is not limited and still available if you dig the more vintage vibe of the color choices. For me, this represents well how Gulf is positioned within the market, and how TAG Heuer knows that different people want different things. Some love the Gulf livery and are fascinated by the newest iterations on Aston Martin, McLaren, and Porsche while there will always be those who yearn for the racing of yesterday and legendary heroes like the GT40 and Porsche 917. Both are right, and both should be honored. The image is the most important, and two images are being cultivated simultaneously in the absence of a physical everyday reminder (since most cities have lost Gulf stations). Current racing fans will probably like the modern style, while vintage buffs like the patina of time. 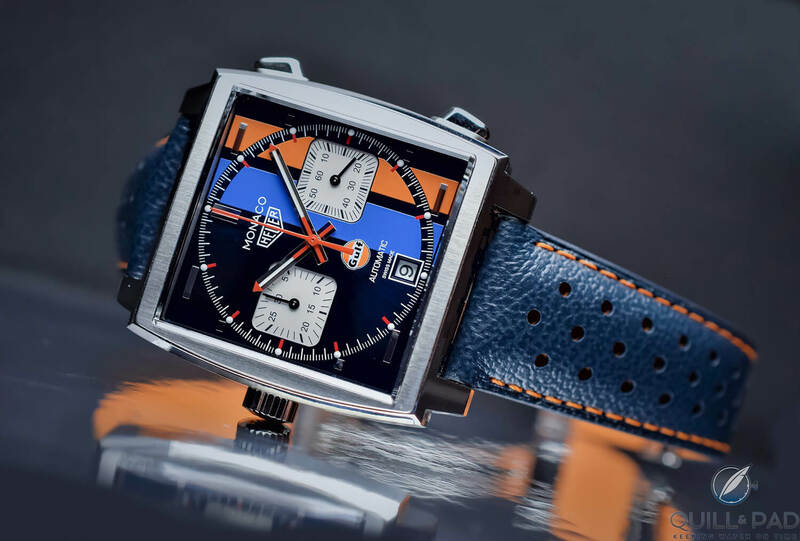 Either way, TAG Heuer is continuing to honor its racing heritage and its connection to the most famous racing livery of all time. The fact that the limited edition had no trouble selling out and I have seen owners rocking the special edition means that others must agree. I look forward to the renewed partnership with Gulf Oil International and the watches (or other objects) that will find themselves clad with the iconic powder blue and orange. Of all the corporate partnerships that brands undertake, this one has the promise to please the widest array of enthusiasts I can think of. And that is how you manage an image! Wowza Factor * 7.8 A Monaco sporting the Gulf livery is simply cool in ways that are hard to capture other than calling upon the visage of Steve McQueen and the golden days of motorsport. Late Night Lust Appeal * 78.8 » 772.764m/s2 I have to admit that the Gulf livery is my personal favorite (such a trend follower I am), and so any Monaco (a super-cool vintage watch) that drapes itself in the powder blue and orange is going to make me stay up all night lusting pretty hard. M.G.R. * 54.1 The historic Caliber 11, which kind of made modern Heuer what it is, will always be welcome inside a Monaco! Added-Functionitis * Moderate Chronograph and date functions make for a pretty capable timepiece, so there is certainly a need for regular-strength Gotta-HAVE-That cream to handle the historically colored swelling! Ouch Outline * 9.4 Rolling an ankle while sprinting down a rocky mountainside! Sometimes I like to hike at a leisurely pace, other times I try to push my own limits. And sometimes I hit those limits. Rolling an ankle isn’t too bad, but in the middle of a long hike it can make for very uncomfortable rest of the trail. Still, I would do it again if it meant finding either one of the Monaco Gulf editions on my wrist! Mermaid Moment * Ooh yeah, gimme that Gulf livery! That is really all it takes when you dig a color scheme so completely. I was booking a reception hall just mere moments after first seeing it! Awesome Total * 650 Multiply the number of limited pieces in the anniversary edition (50) with the caliber number inside (11), and add the depth rating in meters (100) and you come to a historically colorful awesome total! For more information, please visit www.tagheuer.com/en-us/watches/tag-heuer-monaco-calibre-11-automatic-chronograph-39-mm and/or www.tagheuer.com/en-ch/watches/tag-heuer-monaco-calibre-11-automatic-39-mm. What Has Kept The Gulf Racing Livery So Special For So Long? Please look at the bottom of the post for all the information.